You can’t hold a good man down for long, as evidenced by both a picking (8-4) and betting (+2.9U) resurgence on UFC on Fuel 7. Those results have me in a good mood despite UFC 157 not being the most intriguing fight card in the world. Let me be clear, I watch MMA because I enjoy watching fights. Especially highly skilled fighters squaring off against one another in competitive bouts. 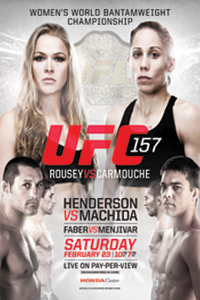 My contention with UFC 157 is that the fight which has become the sole focus of this card is not a competitive fight. I treat Women’s MMA just like Men’s MMA. When the fights are intriguing, I will be intrigued. When they’re not, I won’t be. If Ronda Rousey was fighting Cristiane Santos or Alexis Davis, I’d be hooked. However, she is fighting Liz Carmouche, and the allure of this being the first female fight in the UFC isn’t enough to draw me in when the fight is so unevenly matched. Thus far in 2013 I’ve made a habit of breaking down the major main events, and I’ve had fairly good success doing so. I had planned on continuing that trend throughout the year, but the headliner of UFC 157 presents a special dilemma to anyone who looks at fights for their competitive balance. In the near decade that I have watched MMA, I don’t think I’ve ever come across a main event which has been more hyped for everything except the fight. I’ve still yet to read an article that actually breaks down the fight from a technical perspective, and for a main event of a major UFC card which is mere days away from happening, that is very strange. In fact, I’ve come across far more discussion about the Dan Henderson/Lyoto Machida co-main event than Rousey/Carmouche.